Finding a metal watch that fits your wrist can be tricky, as most bands are only available in a few standard sizes. 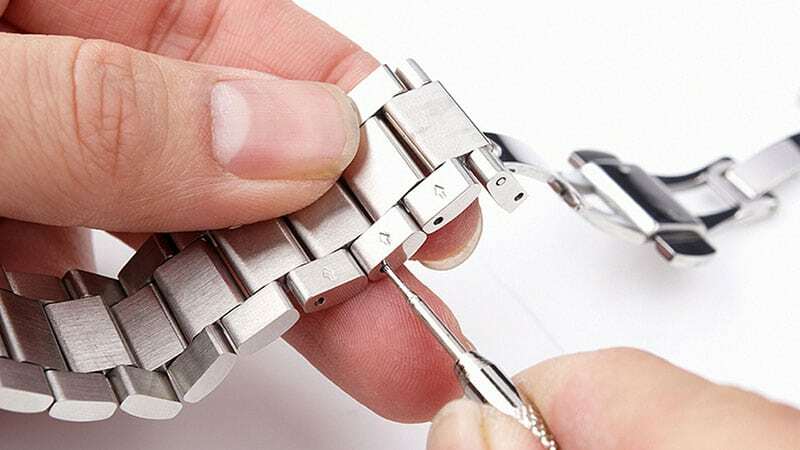 But not to worry, by removing some links you will have the perfect watch band size. This might sound difficult and time-consuming, but with these simple steps its a breeze. 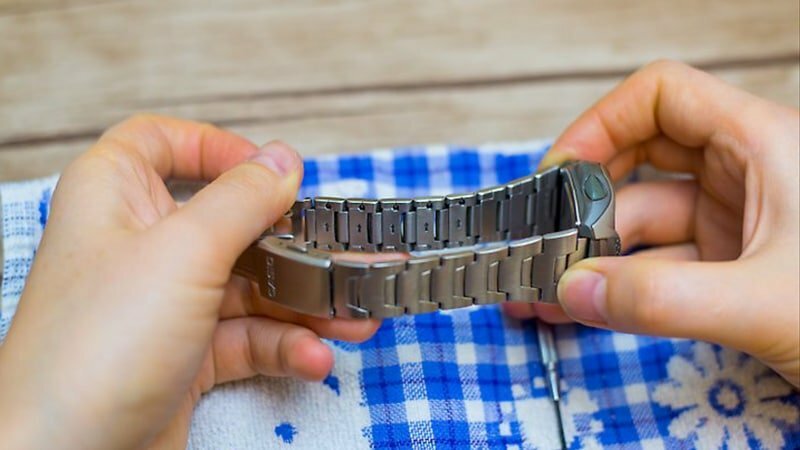 Below is a guide on how to remove watch links for a better fit. The first step is very important. If you take out the wrong amount of links or remove them from the wrong place, your watch will sit lopsided. 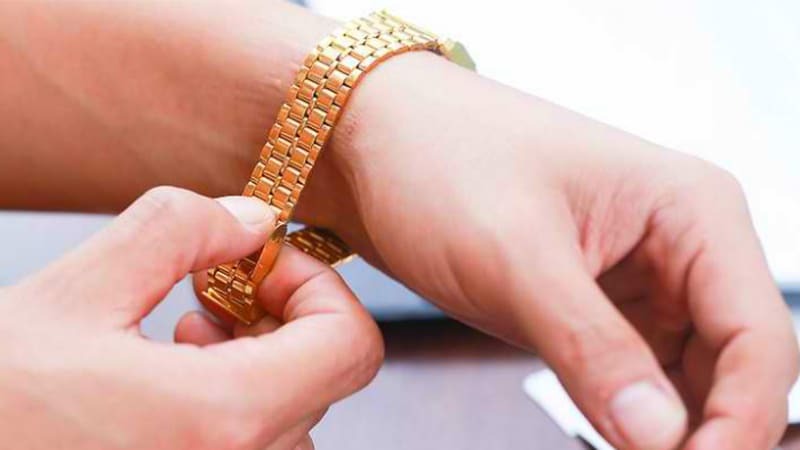 To measure how many links you need to remove, firstly try on your watch and position it where you would usually wear it. Gather up all of the slack and count the number of excess links. You want the clasp to remain in the centre of the band. So instead of removing all of the excess links from the middle of the watch, take an equal amount from either side of the clasp. Removing watch links is a very delicate process. You want to ensure that your working on a flat surface with plenty of light and minimal distractions. We recommend placing something at the edge of your workspace to stop small pins or ferrules from rolling away. This will decrease the risk of you losing any pieces. It’s also worth placing a mat or something soft underneath your work to prevent you metal watch from scratching your bench top. Keep in mind that hammering out pins can be surprisingly loud so you might choose to work somewhere more secluded too. This is is for your benefit as much as anyone else’s as the removal process requires your full and unwavering attention. 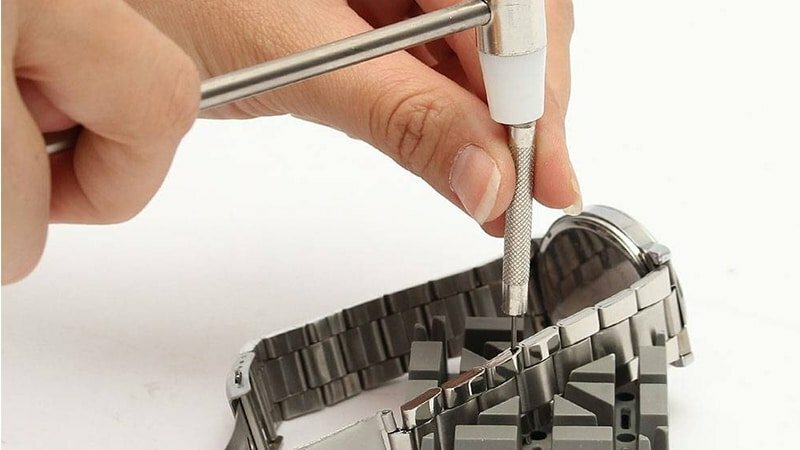 The process of removing links from your watch is indeed no exception to the old saying, use the right tool for the right job. You will want to make sure that you have the necessary equipment before getting started. 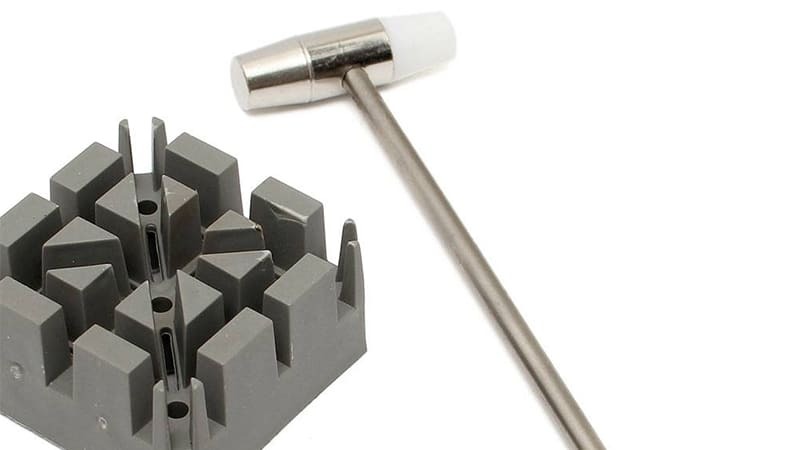 A push-pin tool is best for removing cotter pins. You’ll also need a small ball-peen hammer and a watch-bracelet holder. You can usually pick up most of these things in a preassembled watch tool kit. Now you know how many links you need to remove and from where you need to remove them from, its time for the hard part. There are small arrows on the back of the bracelet showing where the cotter pins come out. Place the watch in the holder or on the foam with the arrows are facing downwards. Using the hammer, lightly tap the end of the push-pin tool over the cotter pins until you can no longer push the pin inside the link. When the pin pops through, remove it using your fingers or a small set of pliers. Be vigilant for any other pins or ferrules that may fall out during this process. Once you have removed all of the desired links, you will need to rejoin the ends of the bracelet. Place the bracelet back in the holder, but this time with the arrows pointing upward. The pins need to go back in the opposite way to which you removed them. Place the cotter pin back in the hole, gently tapping it with the hammer as needed. Repeat this on the other side of the clasp until the bracelet is the desired size. Always make sure the fastener is centred and remember to tap any ferrules that fell out back into place too.